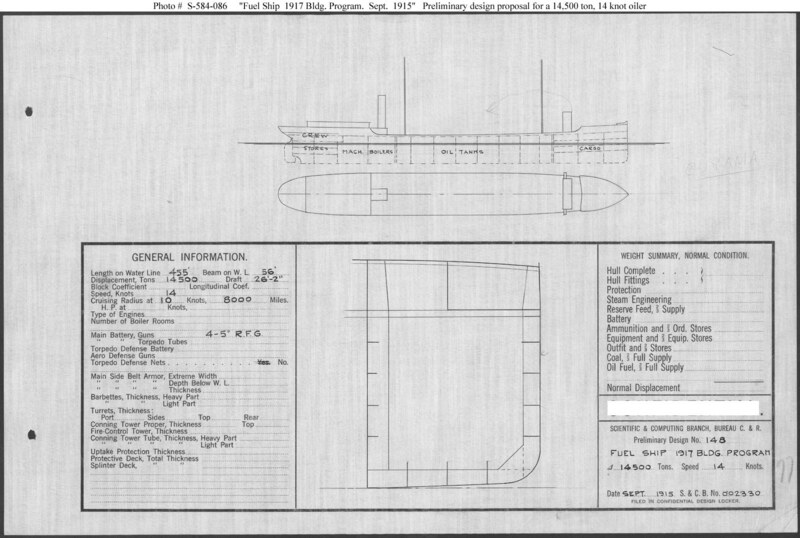 Preliminary design plan prepared for the Navy Department during consideration of a design for a fuel ship (oil carrier) to be included in the Fiscal Year 1917 program. This design concept was similar to that adopted for the Navy’s first fleet oilers of the Kanawha (Fuel Ship # 13) class, with the bridge forward. Its layout differs from the Neches and Brazos (Fuel Ships # 17 and 18), which were authorized in Fiscal Year 1916 but which did not receive appropriated funding for construction until Fiscal Year 1918, and which had the bridge nearer amidships. No subsequent fuel ships were authorized in Fiscal Year 1917. This plan provides four 5-inch guns, steam machinery and a speed of 14 knots in a ship 455 feet long on the water line, 56 feet in beam, with a displacement of 14,500 tons.